9.) Heritage House – Liberty Square in the Magic Kingdom is home to the popular Haunted Mansion attraction that many guests enjoy each and every day. In addition to the popular spooky experience, guests can also enjoy the Hall of Presidents which shares the story and legacy of the Presidential office before an impressive finale where each President of the United States stands together on stage. Found just next door to the Hall of Presidents is a small brick building that’s second floor is actually used for parts of The Muppets Present…Great Moments in American History. 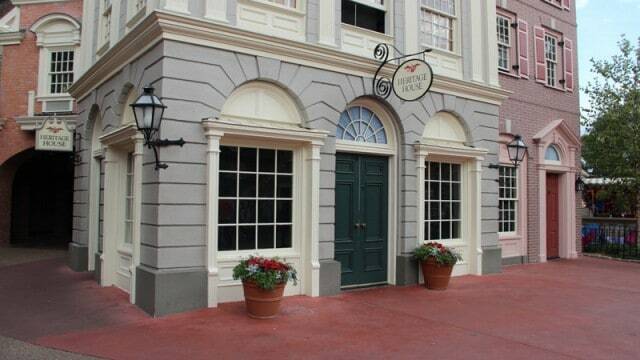 The building is the Heritage House which currently serves as the Liberty Square Ticket Office for Annual Passholders and previously has been used as a location for special merchandise sold for various themed parties. Just next to the Heritage House is a coin press machine that offers three patriotic options. Guests can pick the image of the Liberty Square Riverboat, the Hall of Presidents, or Mickey standing with the American flag.